The AIM NetworkSocial JusticeIs there a prescription drug shortage we don’t know about? On a semi-related issue, I went along to the chemist yesterday to buy some Panadeine (which I haven’t bought in ages) and the hoops I had to jump through stunned me. I had to hand over my driver’s licence and my details were entered into some new government database. It’s the new law, they said. The chemist also said that Panadeine will soon be a prescription only medicine. That won’t affect me one little bit, but I’m sure that it will be another out of pocket expense (a visit to the doctor) for many who can’t afford it. Years ago HRT drugs used to run out around every April and it was a mad hunt from pharmacy to pharmacy to try and get a script filled. I don’t know what the situation is now since I don’t take them anymore. I use the bio-identical now made up by a compounding chemist – no shortages. Both Sudafed (original formula)and Panadiene contain ingredients for the manufacture of illicit drugs, hence the restrictions. You can’t buy any drug containing codeine over the counter in the USA, haven’t been able to for years, for this very reason. Pseudoephedrine (from Sudafed original formula) can be used to manufacture meth. With such a major drug problem developing in this country, I am not surprised by the changes in this respect, it was a natural extension of trying to control the explosion of the highly dangerous drug trade. I agree it is a darn inconvenience and additional cost for legitimate users of such products though. A follow-on effect may be that demand will fall and therefore prices will increase or supply suffer. My godson married a girl whose family hail from Bathurst, NSW and she is a great granddaughter of former Prime Minister and Labor leader, Ben Chifley. I have often said that Chifley was responsible for increasing the lfespan of millions of Australians by introducing the Pharmaceutical Benefits Scheme back in 1946. Following is an extract from Wikipedia detailing some of the Chifley government’s achievements; The Chifley government passed legislation to establish a universal public health system modelled on the British National Health Service, including a free formulary of essential medicines.This was successfully opposed in the Australian High Court by the British Medical Association (precursor of the Australian Medical Association). Chifley then organised one of the few successful constitutional referenda to insert a new section 51xxiiiA which permitted federal legislation over pharmaceutical benefits, together with family allowances, benefits to students and hospital benefits, child endowment, widows’ pensions, unemployment benefits, and maternity allowances. The subsequent federal legislation in relation to pharmaceutical benefits was deemed constitutional by the High Court. This paved the way for the Pharmaceutical Benefits Scheme, an important component of Australia’s modern public health system. I may be a bit naive but I always believed that one of the prime purposes of a government is to safeguard the wellfare and wellbeing of the people (all the people). Why can some governments punish so many disadvantaged people when the government has no financial constraints whatsoever, being a currency – issuing government. There are many things in your article to answer. I will do my best. If your specialist mentioned a different drug would have different side effects, he wasn’t talking about a generic substitute but an entirely different drug – there aren’t generic equivalents for all drugs. The government sets a price on how much they will pay to the pharmacy for the sale of any medication. The price does not depend on what the pharmacy had to pay to the supplier – it is based on the cheapest price you could get that drug for if you bought in huge bulk. As drugs have specific shelf life, obviously community pharmacies cannot buy individually in bulk which is why you have seen the rise of chains and the demise of independent traders. But those chains then dictate what lines those pharmacies can carry. These are not politically motivated or manipulated. They are a direct result of import hold-ups. There is a website that warns us what is going on in that respect to give some opportunity to prepare or deal with anticipated shortages along with estimates of how long they will take. Why they occur from the distribution end can be for a myriad of reasons causing a breakdown in the supply chain. It is common for nearby pharmacies to ‘borrow’ from each other. We have allowed big pharma to be on the board of our PBS and it has caused us to make some bad commercial decisions. This is a dated but very interesting article about that showing how others, NZ for example, have gotten far better deals from suppliers. One of the biggest concerns about the free trade agreements is the effect they may have on our PBS because it limits the profits of big pharma – there are also very bad clauses allowing the evergreening of patents (ie change the drug minutely or find another use for it to extend patent and stop others from producing cheaper generics) and for the protection of intellectual property implying those who want to produce generics would have to go through their own testing, unable to use the results from another company’s clinical trials. Robyn, the strongest thing I could buy in America without a script was ibrobrufen, which was fairly inadequate for what I needed it for. I had to take the low road: a visit to the doctor and two prescriptions set me back US$263 (about $300+ here). In Australia a pensioner (assuming the doctor bulk billed) would have paid a total of $12.40. Gosh I love the Aussie system. Michael, when I was Thailand you could get valium over the counter. (It was last century so don’t quote me about current regulations – it may have changed). I guess they’re a nervous lot over there, Kaye. ? Shouldn’t we also finally tackle the obesity epidemic, and there would be no need to stack our pharmacy shelves with diabetes 2 drugs. I should also add that wastage for pharmacies is huge, Write-offs for out-of-date stock are always a significant amount. Often your ordering, especially for expensive drugs, is specifically for a current client. If they get better, move, or die, you can be left with very expensive unusable stock which is why pharmacies don’t carry all lines but can order them in. Most pharmacies receive daily deliveries. Some cancer injections cost thousands of dollars each. The amount the government pays to the pharmacy is based on the wholesale price of those injections bought in bulk. Small pharmacies either have to wear a loss (or a miniscule return on thousands of dollars investment only redeemable after the sale is made and the PBS claim processed) to provide what their customer desperately needs or choose not to help them. It is a horrible dilemma – commerce or compassion. My suggestion is that the government becomes the wholesale importer/distributor of drugs. We then achieve the economy of scale in purchasing plus they could supply our hospitals at cost price thus reducing hugely our health bill. Pharmacies continue as small businesses but they buy their supplies from the government supplier. @ Kaye – I may have used the wrong term – I know about the patents and cheaper generics, I quite often get them for SOME medications, but not all – this wasn’t the issue here, it was the pharmacist’s understanding of the system. Because it was a different brand, one pharmacist didn’t want to dispense it as an alternate for me, but the other pharmacist was happy to do so as it was exactly the same dosage of exactly the same drug. Which pharmacist was following correct procedure was my passing thought at the time. Thank you for the link to the shortages website – I am sure that may prove useful to many readers. Although it is doubtful they would ever officially offer as a reason for a shortage that the pharmaceutical company had chosen to send production elsewhere for a better price. I am not as convinced as you are that there is no political impact – but I think my use of the term political is broader than the context in which you are using it. No, I’m not suggesting there is direct political intervention to create shortages – however the other aspects you have mentioned re supply are politically driven and have indirect impacts on supply. Bad commercial decisions being one of them. The expiry date of medications is a complication, especially in a country with a relatively small population. Wastage is a cost to the industry that has to be factored in. Demand analysis would be critical and complicated, I am sure. I like your idea of a central supply – but would our government (of either persuasion) ever take such a monumental step? @ Helvityni – yes, and one way to do that is to teach nutrition from primary school. The things I am learning now I should have started learning when I was about six. Many grow up with a rough idea of what we should eat, but in our over-fed society it is just so easy to eat way, way, way too much. Robyn….I have just found a restricted industry article (membership, not censorship) that might answer some questions. I will get access and share it. What’s causing all these medicine shortages? Ok. Rather than signing up and getting flooded with emails, I am getting a copy of the current pharmacy news magazine this evening which has an article about the drug drought. One reason I was given for shortages is repackaging. If one company takes over another, or even within a company, you get delays as they make and transfer to new packaging. Also unavailability of certain ingredients holds up manufacture. In response to my query about why are drugs cheaper in NZ, I was told that they have price advantage but not choice advantage – the government gives one supplier sole rights so they get it for very cheap prices, but they lose the choice of other similar drugs. Dramatic and ongoing cuts to the PBS have forced generic manufacturers to constantly change suppliers looking for cheaper ingredients, sometimes from China, causing interruption to manufacturing. It has also led to drug companies diverting stock to more profitable markets (the article does not elaborate on where they might be). The complexity of manufacture with ingredients coming from many different places makes it vulnerable to supply chain interruptions due to bad weather or logistical hiccups. There can be a domino effect if there is a shortage of one drug, with similar drugs being quickly sold out. One interesting example is the shortage of whooping cough vaccine. The government chose to make it free to parents and grandparents of newborns which used up stockpiles. Then there was an unexpected spike in demand when a 4 week old baby died in Perth. The vaccine takes 18 moths to grow so there is a time lag between the increased demand and any possibility of increased supply. The government no longer gives out the vaccines free and there remains a critical shortage that won’t be assuaged any time soon. Robyn, may I suggest you email Caro Meldrum Hanna from Four Corners? If there is a scandal she will get to the bottom of it for sure. I am on 9 meds and much of your post regarding unemployment rang true with me vis a vis pain, meds, hours of exercise, treatment etc. Fortunately I am comfortable retired. I too have several AI diseases and several doctors, but I usually have no problem with getting my meds pretty much anywhere? I guess it depends on the drug? Or maybe the suburb? I have a friend who is a roving pharmacist visiting nursing homes and providing advice on a more manageable drug regime. One drug instead of two that does the same etc. He has told me about the drug companies lurk with new drugs. Once the molecular structure for a new drug has been patented, the company has a period of time during which they have sole right to that molecular structure. Hence they chrage the earth and market like crazy before the chemical becomes legally reproduceable by other drug companies who may undercut them on price. So the drug companies flip the diagram, re register the drug under a different name and again market like crazy and charge the earth. Hence Claratyne becomes Aerius etc. Your pharmacist will know this. Can I suggest you become familiar with the active ingredient in your meds take a photo on your phone of the ingredient list on the packet. That way it is always with you. I am a bit concerned that your pharmacist is able to provide an alternative especially given he/she is not qualified to assess your suitability eg other meds, conditons etc. I understand the pharmacy that wanted a new script. Maybe use a big pharmacy in a busy shopping area? More turnover. Chemist Warehouse do a thrashing trade as do Priceline so they can afford to keep more drugs on the shelf. As an American, I’m embarrassed to inform you that the global shortages (including Australia’s) and skyrocketing prices of generic prescription drugs were “Made in the USA.” The root causes of this unprecedented public health emergency are the anticompetitive contracting and pricing practices, self-dealing and kickbacks of giant US hospital group purchasing organizations (GPOs), which control purchasing of more than $300 billion (USD) annually of drugs, devices and supplies for about 5,000 US healthcare facilities. For a primer, read our New York Times op-ed of Sept. 3, 2013, “How a Cabal Keeps Generics Scarce.” It’s posted on our website, along with extensive documentation on this issue: http://www.physiciansagainstdrugshortages.com. The most effective action your leaders can take is to publicly insist that President Obama/President-elect Trump move to repeal a misbegotten 1987 federal statute called the Medicare anti-kickback safe harbor provision, which exempted these cartels from criminal prosecution for taking kickbacks from suppliers. This created a “pay-to-play” scheme in our healthcare supply chain that has undermined the economics of the global drug industry, particularly generics. Phillip L. Zweig, executive director, New York City. Another thing that may help Robyn?? Two of the drugs I am on have issues re quantity. One could kill the other is a steroid. The doses I take of each are pretty high so under a normal prescription I was needing to visit the doctor every couple of weeks for a re script. Now she rings the NHS and gets a permit code to allow the drug to be dispensed in larger quantities. Saves excess appointments. The other thing that may help is if you contact your specialist/GP and mention the difficulty getting your script filled they may, just may, have samples to tide you over until the pharmacy can purchase the drug in question? They don’t always have samples but frequently, especially for new meds, the salesperson for the drug company will hand out some samples for the doctors to encourage them to prescribe their product. Another friends daughter is a drug dealer. Well that’s the joke we all tell. She works as a travelling saleswoman for a pharmaceutical company. I would also suggest to, where possible, stick with the same pharmacy, particularly if they are uncommon or expensive medications, because they have record then of your repeat prescriptions and can anticipate your next repeat and order accordingly in advance. Wasn’t it the Australia Institute in a report last year claiming that our government is spending too much on medications? If pharmaceutical companies are choosing to sell overseas where a greater profit can be made, then forcing them to lower the price even more could result in more shortages here. Although generic drugs do have the same active components as their previously patented counterparts, in some cases the fillers used can make a difference. Sometimes generics are not so effective, and sometimes there are people who are allergic to some or many of the fillers (e.g. my mother-in-law). Considering all the difficulties my MIL has with multiple medical problems and compatible drugs, New Zealand would be an absolute nightmare for her. @ Michael Taylor – I had a conversation with a couple of pharmacist friends a few months ago and said how annoyed I was at the interrogation I get in pharmacies every time I purchase a drug. I was told that they are now required to do so by law and I would be amazed at how many patients have been given a script by their GP with absolutely no idea why they are required to take the drug, nor what potential side effects could be experienced. When I said my GP discusses the pros and cons of various drug choices with me and then allows me to make an informed decision, they both assured me that my GP is better than most. Through this compulsory questioning they discover a lot of patients taking incompatible medications or incorrect doses. Athena, if you go to the same chemist to get all your medications, it comes up on the screen if there are contraindicated drugs. And you would be amazed how many times doctors prescribe wrong doses or bad drug combinations but it is the chemist who is legally liable if they follow the doctor’s incorrect directions. That is why I don’t like Chemist Warehouse or Priceline or those big warehouse chemists – they don’t take the same health care of their customers as they are just interested in the sale. told me about the drug companies lurk with new drugs. Once the molecular structure for a new drug has been patented, the company has a period of time during which they have sole right to that molecular structure. Hence they chrage the earth and market like crazy before the chemical becomes legally reproduceable by other drug companies who may undercut them on price. So the drug companies flip the diagram, re register the drug under a different name and again market like crazy and charge the earth. As I understand it, a patent on a drug in Australia now lasts for 16 years (was 14 years) and yes, near the expiry date, ‘technical’ changes are made so that a new patent can be granted. Therefore the effective patent protection can be doubled. Not uncommon. Under the TPP, the duration of the patent was to be extended by 25% – out to 20 years. This is the patent protection afforded in the US and was to be extended to all TPP member states. This extension wasn’t talked about too much by Robb et al, but there was some publicity. @ Kaye – loving your research! I feel I should be paying you! Seems like my pharmacist had been reading the industry material and was telling me exactly what was happening – or part of the problem anyway. Clearly there IS a problem. One caution to everyone re generic drugs. For SOME people (I’m one of them) enteric coating is important to protect the stomach lining from some drugs. Now, I can’t for the life of me recall where I read it, but it was a reputable source: some generic brands, to cut production costs, do not have the same quality coating (in some cases no coating at all) as the originals. For people with no stomach issues or who are on drugs of concern for a short period, this is not an issue. For people like me, it IS an issue and we are much better to stick with the original brand, even if they are more expensive, to protect our gut. I would also say I have had wonderful service from my local Chemist Warehouse most of the time. I got terrible service from one in Prahran. They are also excellent at discussing the drug combinations with me. For example, I can’t take Nexium and carbimazole together, it can result in malabsorption of the carbimazole. Anyone who boosts their fibre intake with metamucil should ensure there is a minimum two hour gap between the medication and the metamucil. @Kerri – it was the exact same thing, just a different brand. I believe that pharmacist was correct procedurally. Athena, the annoying thing for me was that the doctor suggested I get Panadeine, only to be confronted by a chemist who tries to get out of selling me any. They want to make all products containing codeine S4 (prescrition only) but the Pharmacy Guild have argued that it can take two weeks to get in to see a doctor and people may not be able to wait for pain relief. This MedsAssist program where they ask for your licence is a voluntary trial to see if we can control the abuse of the drug without having to make it prescription only. Yes it is a pain but it is better than having to go get a script. Incompatibilities can also exist between drugs and non-prescription items. I was about to buy a cold and flu preparation a couple of years ago and when asked about current medications advised that I was taking irbesartan. I was then told that it was unwise to take the cold & flu meds and a combination of ibuprofen and paracetamol was recommended instead. Some alternative medicines are incompatible with prescription medication too. I avoid Chemist Warehouse since learning from a pharmacist friend who used to work there that they pay their staff low wages compared to other pharmacies. They don’t increment pay increases for increased staff experience either. I prefer to support businesses who value their employees and pay a fair wage. Re: the pharmacist being liable – that is understandable if the pharmacist has a list of all the patient’s medications in front of him/her. The doctor may not know about other medications if the patient sees multiple doctors. I should also add, if a doctor prescribed what a pharmacist would be reasonably expected to know is a wrong/dangerous dose, the pharmacist could be liable if he/she dispensed that dose without question. However, the doctor would also be liable for the error in the first place. 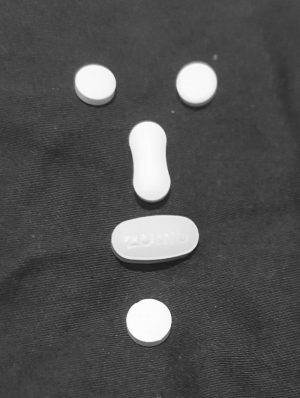 I’ve read two reports on the underdosing of cytarabine that took place in two metropolitan SA hospitals last year (it has been in the MSM on several occasions). There has been no disciplinary action recommended for any pharmacist. Eight medical officers were referred to the AHPRA for review. Yes Athena there are a whole range of scheduled drugs that can be bought over the counter but questions must be asked first, like could you be pregnant for example. On pharmacist liability, they are in the same boat as the doctors if patients go to multiple surgeries and pharmacies. Sometimes medicare issues alerts when they pick up on someone doing that but I have known of a doctor who overrode the alert when contacted by a pharmacist informing him of the warning. Doctor insisted script be filled, patient overdosed. The chemist had kept a record of the conversation and that covered him in the ensuing investigation but he suffered agonies of remorse. The cancer medication was slightly different. The dose was within acceptable range just not appropriate for these patients, so the pharmacist would not be necessarily alarmed. I also don’t know the drug – is it a set injection or drawn from a bulk supply by nurses? From what I remember, it was queried (can’t be certain by who), but the doctor overrode the query? That recall is off the top of my head – I may be wrong. I can’t for the life of me find it now, but someone above commented re patients who see different doctors – I see four specialists and a GP, ALL prescribe medication, either tablets or creams (dermatologist). I learnt very early on to let each know what all the others were prescribing and if I changed meds to discuss the situation with a pharmacist. Yes, they all write the requisite reports to each other, but essentially it comes down to the patient to be the “case secretary” I think, due to the silo nature of our medical system. I suppose to a degree the doctors work out pretty quickly how involved the patient is in their own treatment and their capacity to keep them all up-to-date faster than each reading reports from all the others. As you can imagine, I can be an argumentative patient – *smiles sweetly* – and I research everything before I take anything. Probably drives them nuts, but this is MY body and I consider that ultimately, I am responsible for what I put in it. To any doctors reading this, I am a good patient, really, I am. Robyn, don’t feel even the tiniest piece of guilt over being a “difficult patient” it is your body and your life! I am always on guard to mention ALL prescriptions and vitamins and many women need to mention the pill as it may have fertility ramifications! Like I said I keep photos of ingredients and lists of meds on my phone and have told my 3 nearest and dearest that on my iPhone, under LISTS, with a header of ambulances and pills they will find a full run down of my med regime, lest I be involved in some form of accident that renders me non-communicative. I also have hubby listed under ICE (In Case of Emergency) which I believe is an international contact ID for next of kin. Robyn, it may have been me who mentioned doctor shopping which is entirely different to your situation. I would recommend sticking with the same chemist if you can as they will help you keep track (not that you appear to need help). Apparently, the codeine trial has not been as successful as it was for stopping the abuse of pseudoephadrine and it is likely that all codeine products will go to script in the next couple of years. Thank you to all commenters for an informative thread on medications and supply. I have reservations about the cut price chemist chains. They have the potential to put the smaller pharmacies out of business and reduce the personal care and monitoring of health that smaller pharmacies can provide. My pharmacist is my go to person for minor health issues and also keeps an eye on my medication regime. They have a service where they alert you by text message when your prescriptions need renewing. Another issue that we have not discussed is the government’s decision to “allow” pharmacies to discount prescriptions by $1. This is optional but is extremely difficult for small pharmacies to adopt. Losing $1 from every script makes a big difference to their income. The discount chains pay low wages and buy in huge bulk so they have adopted the discount, forcing many small independents out of business. “This means that Concessional patients who choose to receive a full $1 discount will need to fill an additional 11 prescriptions during the year to reach their Safety Net and access free medicines. These patients will receive no net annual benefit from the $1 discount. They will reach their Safety Net later in the year and be on the Safety Net for a shorter length of time. So much for helping small business. Every word in that comment of yours is spot on. Knowing the mess that appears to be looming, it is up to every patient to question and re-question the doctor … and especially the pharmacist ( nicely of course ). It is as much our ( lay-persons ) responsibility to take care of our own bodies and health, as it is the doctor / pharmacists’. And there is absolutely no harm in pressing the points ( arguing ? ) … although I can think of a few ‘specialists’ I have seen over the years who would very much look down their noses at that !! Reading the pamphlets that are ( occasionally, supposed to be always ) provided with drugs, is frightening – but the pharma companies show these ‘probable and possible’ side effects, and advice as to how to administer the meds., to protect themselves against litigation – – of course. @Kaye – It was the purchase of Sudafed and the like, that was under investigation to halt or register , because that is what is used to make illegal substances e.g. * meth / crystal meth * – [ the pseudoephedrine in those products was/is used ]. Codeine on the other hand, belongs in the morphine family – and can be illegally re-used, but for different reasons. … Occasionally they are prescribed together, but phenylephrine has replaced a lot of the use of pseudoephedrine, from my research. Will ask the chemist some time soon about that. I do not access the $1 discount – as it does reduce the number of weeks left in a year to adopt the Safety Net. It seems that the Safety Net itself has been reduced – or rather, more prescriptions have to be filled to reach it anyway – in the past couple of years. Stand to be corrected on that. I doubt it has much to do with ‘protection’ but rather is an ‘information gathering tool’ by the Government – who also require doctors to fill in pages of a comprehensive form, to submit to them, ( every 3 years I think it is ) about a patients’ current disabilities, ongoing medical issues and what they are being treated with. A patient CAN request a copy of that – the doctor is obliged to provide it. At least, any doctor I have seen at those times, has automatically printed out the information for me. Behoves us to take good care of ourselves, and ask, question, ask. A short while back, I happened to be looking at a packet of generic ‘Strong Pain Relief ” ( equivalent of Panadeine ) for some peculiar reason … Same dosage of ingredients = 500 mg paracetamol, 10 mg codeine. … and noticed where it had been made. “Made in India”. I freaked out somewhat, and after I calmed down and realised I wasn’t dead yet … that nothing in them had harmed me, that they had done the job to relieve pain, I took a look at everything else I could lay my hands on. Have sub-cut injections ( daily – anti-coagulant ) from France, Nurofen ( from Turkey ) which I do not take – ( not permitted ) … for my partner – and everything else I have in my cupboard of nasties, was made in India. … I buy generic brands, promoted by the larger pharma companies ( Chem-mart is one ) who ‘own’ my chemist now. He was formally a very successful private business. … I trust him implicitly. The silly thing is, the difference in price between generic Panadeine and the trade brand named Panadeine is very small. Next time I need it, I will buy the actual brand name and see where that is made. Wouldn’t be at all surprised if ‘Made in India’ shows up. Another chemist told me, 2 or 3 years back now admittedly, that the ‘coming out of date’ tablets / caplets / capsules are sent from here ( and I presume many other western countries ) to third world countries. Overstock is off-loaded. But ONLY the oral meds. Never injections which have a shelf life of appox. 1 year at best. … In fact, when one approaches the 11th month towards an expiry date of injections, they should be discarded, preferably by returning them to a chemist for disposal – – and a new prescription filled. They can lose rapidly their effect, and at 12 ++ months from date of production, can be toxic. I use ( when I have to ) IM ( intra-muscular ) injections, self administered – for anaerobic infection ( too long a story to go into ) … a very strong anti-biotic called Lincocin ( lincomycin ) which is ‘supplied’ by Pfizer in Australia, but I suspect is actually made in the U.S. …. unlike most other meds. it does not show the country of manufacture. Only by research have I deduced it is American made. Just a few other tid-bits of info I figured I could share. The cytarabine incident was detected by a pharmacist who dispensed it for two patients on the same day and noticed that the doses were different so queried it with the more senior of the two requesting clinicians. That’s very wise. My mother has multiple health problems, also sees 4 specialists and a GP and keeps a list in her purse of all her medications and doses. She collapsed a few years ago and was taken to hospital in an ambulance. It was very simple then to produce the list for the ambulance officer, who expressed his gratitude that this information was so readily available. By contrast, my mother in law also has multiple health problems, an even more extensive list of medications that is exceeded by her list of allergies, including to fillers in several drugs. She doesn’t keep any of it written down and her medic alert bracelet is 8 years out of date. Earlier this year she was taken to hospital in a confused state and was unable to tell the doctor very much at all. We didn’t have all the details either because she is difficult when we try to obtain this information from her. When she got home she was told to create such a list and update the details on her medic alert bracelet but as far as I am aware she still hasn’t done it! The other problem with patients seeing multiple doctors, is that sometimes patients do it just to get more drugs and they deliberately conceal this fact so the doctors are unaware that they may be prescribing incompatible medications. These patients also get the scripts filled at various pharmacies to avoid detection. I had a friend with years of debilitating pain and subsequent sleeping problems and depression who did this. Some of her friends, including me, tried to talk some sense into her but she wouldn’t listen. Eventually she died at the age of 48y due to a drug incompatibility. Sadly, it was just after a new treatment for her pain became available and she was pain free for the first time in many years. I empathise with the situation re. your mother-in-law. … And applaud your own mum’s good sense. My Mum was like that also … altho she did not have a medic-alert bracelet. She was most reluctant to speak to her family about any medications or results, sought meds. from different doctors ( while denying it ) … and would NEVER request further information from a doctor – as ” he knows what’s best – I wouldn’t DREAM of asking a doctor any questions ” …. Doctors are not mind-readers, and it was with great relief ( because Mum became quite deaf and refused to wear her hearing aids ) when my sister took over taking her to medical appointments, and could speak on her behalf if things got a little awry. There was lots of sneaking around, sticking our noses into everything to find out what drugs she was on – and more importantly where she had obtained them and who the doctor was on the label. Admittedly, Mum was in her late 80’s when all this was happening so was perhaps becoming mentally ‘difficult’, and she finally suffered a stroke which left her with vascular dementia. A very sad situation. She passed away in 2010 at the age of 101 years and 1 day. A mate of mine was on Stalazene. But, he could no longer it. I asked the Chemist where I go to with the same result. We both were told that it’s a world wide shortage. He went on to another medication, and, he started with very bad side effects. Now his side effects are just about gone. This exact same thing happened to me over a year ago, a popular anti depressant went missing i was given the ‘alternative’ which they declared was exactly the same. I can assure people they are not the same at all. I went into a melt down for many months with reactions to the alternatives while chemists and doctors treated me like a child. There are alternative binding elements and coatings that differ in these alternatives that people may have reactions to. One made it impossible for me to stay awake, another caused leg jerking and anxiety never experienced previously. Thing that was most annoying was the excuse of the factory flooding, yet other countries did not run out. Any wonder there is a suicide problem when drugs are swapped without real investigations on possible consequences and at times people just dont see the connection due to the constant they are the same lines. Its a real problem and it took me well over 8mths to get onto another drug alternative that didnt make me want to end my own life! That Chick, I agree with you, 2 of my doctors have also the degree in pharmacy and both said that the replacement drugs are not the same. Valium and the generic drugs are one example among hundreds of drugs. Currently it is required of any chemist, ( who goes by ‘the book’ ) to ask for ID, – drivers licence – before dispensing any meds that contain codeine. This is infuriating. My own chemist who I have been buying from for years, does not bother, but a locum in his place, did. From Jan next year, the likes of Panadeine will only be available on prescription from your G P – i.e. anything containing codeine. So, for the sake of, say, 8% of bods using it for illegal purposes, 92% of us have to suffer inconvenience. The latest drama was with the Pfizer brand name Valium, (diazepam), but the generic version was not affected. The Pfizer suspect batches were recalled, having non dangerous drug replacement in place of the diazepam. Thing is they’d have had no effect for say epileptics, who take them in conjunction with (or not) anti-eps. Anyway folks, that is what we face. Pity the gov’t don’t address this misuse, in better ways, upgrading & intensifying agencies that find and jail these home chemist brutes, instead of having legit chemists maintain linked registers, and having to ask a myriad of questions in their busy days. I certainly understand your frustration, truecrimeforever – as shown in my previous to yours, post. The entire stock of Valium was ultimately taken off the shelves for a short while a few months ago, but the situation was quickly restored. I am now wondering if there will be any repeats shown on prescriptions for tablets containing codeine ( as from January 1st, 2018 ) …. At present a repeat prescription can be given within about a week of the original being dispensed ( for anything ). It will be interesting to see if a) doctors are permitted to write repeats at all, and b) if permitted, the repeats will be limited – say to 2 repeats only. Doctors are busy enough now, without having to deal with people who want pain relief which has been available for so long without prescription. I think the government has ( again ) shot themselves in the foot with this little caper.